Situated between St.Tropez and Monaco close to Grasse, on the hill tops of Cannes, not far from the Islands of Lérins. Connected to the municipality of Le Cannet, whose history and cultural heritage are closely bound to St. Honorat Monastry. Since 1956 “The Ranch camping” offers calm and peaceful holidays “You can even hear the grass growing” in the heart of the whirling Riviera. From April to October benefit from the sweetness of our climate and the events on the Riviera. Arriving with your tent, caravan or camping car or intending to rent on site, we are sure we will be able to make you happy among our 100 pitches and 30 rentals. From The Ranch, frequent bus services take you to the center of Le Cannet, Rocheville, Cannes and La Bocca, close to the sandy beaches, to the shops and provencal market. On a wooded hill 21,000 square meters of botanical park, a garden of eden, a haven of peace where noise and speed are prohibited. Renewed in 2003 the modern sanitary equipment offers you better comfort with facilities for babies and handicapped persons. The covered swimming pool is open throughout the season. We have a playground with trampoline for younger children and a covered terrace with billiard, ping pong and hand football table. 200 meters away, you will find a tennis court. At 800 meters a football ground and the eventful hall of “la Palestre”. Or park is equipped with a laundry and a grocer’s shop. We can provide you with ice packs. mail collected and delivered daily. 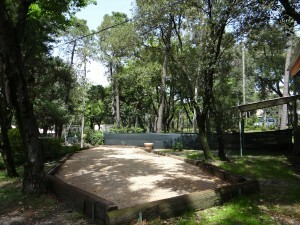 The Campsite Le ranch propose to you a new bowls-playground, situated just next to the game terrace ! Do not hesitate to come to ask for a game of bowls (free in the reception)! 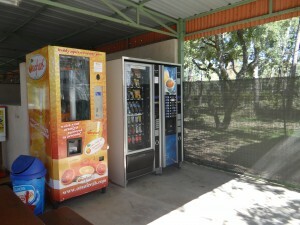 We also propose you machines with automatic dispensing of hot and cold drinks and candy. You can savour a cool orange juice there, freshly pressed before your eyes, ideal for your breakfast. Book your stay in our campsite in few steps ! Localise the camping on the map and know everything about the access.